Description CLEAN CARFAX, EcoBoost 3.5L V6 GTDi DOHC 24V Twin Turbocharged, 4WD, Alloy wheels, AM/FM radio, Electronic Stability Control, Front fog lights, Front wheel independent suspension, Fully automatic headlights, Illuminated entry, Low tire pressure warning, Occupant sensing airbag, Outside temperature display, Radio data system, Radio: AM/FM Stereo/Single-CD Player, Rear step bumper, Remote keyless entry, Security system, Split folding rear seat, Steering wheel mounted audio controls, SYNC, Telescoping steering wheel. 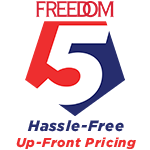 Here at Freedom we know your time is extremely valuable, so we shop the surrounding market prices so you don't have to! Priced below KBB Fair Purchase Price! Clean CARFAX. Odometer is 3520 miles below market average!